Bluetooth headphones are regularly available for around $20 these days, but if you want truly wireless headphones (with no cord running between the buds behind your neck), you’ve been forced to spend $180 and up for options from the likes of Motorola and Bragi, or $159 starting next month for Apple’s AirPods. Luckily, a new competitor has emerged to bring wireless tech to the rest of us. The floodgates of truly wireless Bluetooth earbuds have opened. At just $40, Axgio’s new Dash headphones are far and away the most affordable set of wireless earbuds released to date, and you can buy a pair right now on Amazon. I had a chance to try out a set, and while they definitely compromise in a few areas to hit that bargain basement price point, they pretty much live up to their promise. Most wireless earbuds to date have included a battery case that can power up both earbuds at the same time, and serve as a power backup for long trips. That’s undoubtedly useful for a product that by definition requires two batteries and two Bluetooth radios, but it’s no surprise that it’s the biggest missing feature from these budget buds. Instead, you get a standard—but actually fairly nice—zipper pouch, plus a split microUSB cable that can charge both at the same time. It’s a clunky solution, but it works well enough. As for the earbuds themselves, well, let’s just say aren’t winning any design awards. They’re pretty large, even by wireless headphone standards, and they’re housed in a cheap-feeling black plastic, though they’re extremely light, and they did stay snugly in my ears thanks to the built-in hooks. Pairing them is like pairing any other set of Bluetooth earbuds, except you have to power on the second earbud immediately after pairing the first to get them to communicate with each other. As with all Bluetooth headphones, I’d recommend having a set for each audio device you use regularly, so you won’t have to deal with unpairing and re-pairing every time you switch. After you’ve got the Dashes synced up, they actually do sound pretty good. There’s definitely more bass present than in most ~$20 Bluetooth earbuds, though there is a bit of audio lag, which can be a problem if you’re playing games or watching video. I’ve seen worse lag from other cheap headphones, but my go-to Anker SoundBuds have all but eliminated it, so keep in mind how you’ll be using these before you buy them. 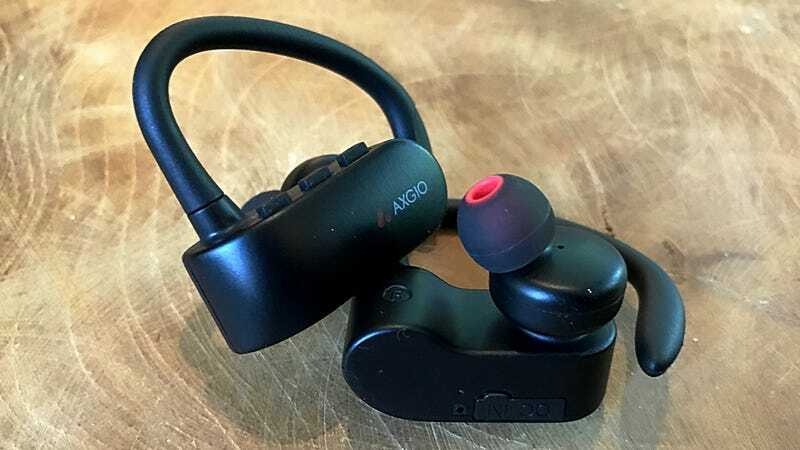 All things considered, I’d say the $40 Axgio Dashes are pretty comparable to most $20 Bluetooth earbuds with wires, so you’re definitely paying a bit of a premium to go wire-free. That being said, they’re the most affordable wireless earbuds you can buy right now by a longshot, and a fine option if AirPods and Verves are out of your price range.